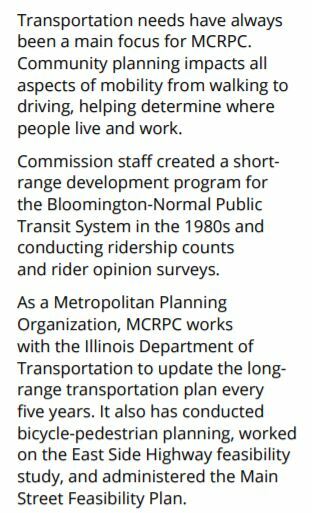 The short answer is because of the McLean County Regional Planning Commission. MCRPC is who obtains the grants for fiascos like Connect Transit. 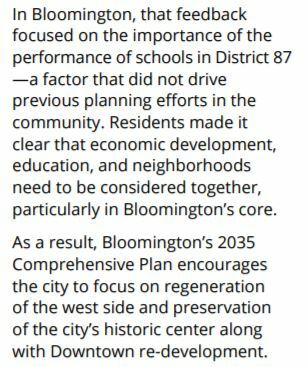 As a result, Bloomington’s 2035 Comprehensive Plan encourages the city to focus on regeneration of the west side and preservation of the city’s historic center along with Downtown re-development. The McLean County Regional Planning Commission is paid to promote ideas that will bankrupt taxpayers. Under the guise of asking citizens what they want, these un-elected people steer government policy to what they want. Agendas and Minutes plus the Vision statement can all be accessed from the same page. The minutes reference financial reports, I can not find a link to that information and it is not included with agenda or minutes. America wasn’t built by government planners. We aren’t socialists where government controls the economy, government plans aren’t based in facts and reality. They are based on the desires of whoever is elected and their cabal. Downtown Bloomington will continue to be the focus unless voters elect free market capitalists. Until then Bloomington and McLean County will continue to decline because the deck has been stacked against everyone who isn’t the “Right Fit” for the plans. Normal is exactly the same, Uptown is the evidence. 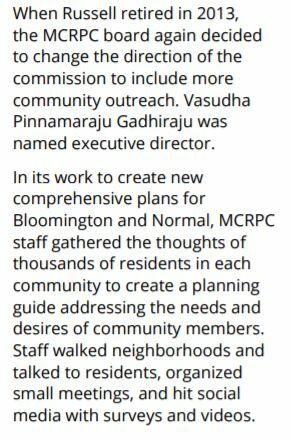 Is it just another coincidence that Vasudha P. Gadhiraju worked as planner for the City of Decatur before coming here? Posted in BloNo, Bloomington, BLOOMINGTON CITY COUNCIL, elections, Local, McLean County, Normal, Progressives, Renner, Taxes.Tagged Bike Master plan, Downtown Bloomington, Master Plans, McLean County Regional Planning Commision, Michael Buragas, Michael Gorman, Vasudha P. Gadhiraju. And I think she is here on an H1B visa. I doubt that. Those are expensive for organizations to acquire, and it’s mostly for technical employees. The are hundreds of universities in America that have an Urban and Regional Planning major, as well as many with Master’s degrees in URP. Unless you’ve actually seen the visa, I think you’re jumping to conclusions. Nothing conclusive just throwing it out there. Didn’t see the visa, extremey unikely to see it, heard it from a very good source. Please note however that “expensive” (unnecessary or foolish spending) has not swayed this council, this county, this state for quite some time. What difference does it make anyway? Not much. Demonrats are in charge for now. We need leaders with intelligence and vision to bring us into the 21st Century. And yes the people who could really help bring about change are leaving the area. A very talented and successful business man that I know just recently departed our area. I sincerely hope I will be leaving in the near future too. I am sickened by what our nice little towns have become. Unfortunately (just like someone with a substance abuse problem) change will only happen here when the bottom is reached. The bottom is not going to be a very nice place to live and I don’t want to be part of it. that being conflict of interest. That may be true of the above mentioned commission. There are just too many possibilities for behind the scenes networking. Sadly, a conflict of interest has become a thing of the past due to apathy. Time for a third party, no. The best thing for us to do is to make an attempt to clean up the two parties. It can only be done by grass roots politics, also a thing of the past. Wake up people! Only good politics can make good government, nothing else can. Central planning never, I repeat never works. It is virtually impossible to plan for all the micro variables that will impact a community, economic or otherwise. At to which, centralized planners are far from apolitical…well, no one for that matter is really apolitical. Anyway, the MCRPC has stacked the deck with those that believe the government should plan and manage the local economy and people’s lives, as documented by Diane. The MCRPC in its quest to plan our lives and economy hasn’t accounted for the major disruption on the doorstep of State Farm, Country Financial, and higher education. Such references are noticeably absent from their plan report. Perhaps, that’s taboo to discuss….again, some politics are involved here. Also, their plan report (which is quite humorous) contains so many fantasies about public transportation, references to “quality of life” as a driving growth factor, and a “favorable business climate” in the Twin Cities. The last one is especially laughable. Very well said…. The detachment from the reality of our decaying 20th Century economic base is apparent in all of the establishment’s narratives about the future here. And yes doing the same thing and expecting different results is still a very good measure of insanity. As the wave of technological change begins to destroy our 20th Century economic drivers, our leadership (business and government) still operate as if it is still 1985 and what they did then will somehow work now. It is comical and deeply saddening at the same time. Vasudha, SURE sure sounds American to me-bet he’s from here also!! I’m VERY familiar with the MCRPC! They were on my paper route back in the 70’s when Joe Warner ran the show and they were on the 2nd floor of the Illinois House hotel. Their BIG brain storm back then was to make Main street and Center one way streets. That would let ALL the people who wanted to SHOP DOWNTOWN easy access. We all have seen how THAT worked out. I believe for every SINGLE ideal they have, they come up with five others that were dreamed up by members of the lunatic fringe..
Not only in Bloomington, but else where. The question that should be on the minds of everyone is not how do we save the downtown but how do we save Bloomington. We are at the beginning of an economic decline that will forever change this area and our joker leadership is worried about the downtown area? Haven’t you ever listened to Renner blab on and on about redevelopment of historic downtowns is the only way to generate economic growth. It must be true because he learned that at the Mayor’s Conferences he attends. Previous Post Don’t forget WHO is to blame for the Coliseum theft!